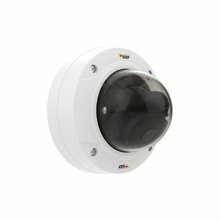 Day/night fixed dome WDR Forensic Capture, Lightfinder, OptimizedIR, IR illumination. Dust и IK08 vandal-resistant. Varifocal 2.8-10 mm P-Iris lens, remote focus и zoom. 720p at 30 fps with WDR, 60 fps with WDR disabled. PoE. Incl mounting bracket.